MHDK hosted an international show i August 2018. We had a great weekend with nearly 50 horses - we will be back in 2019! 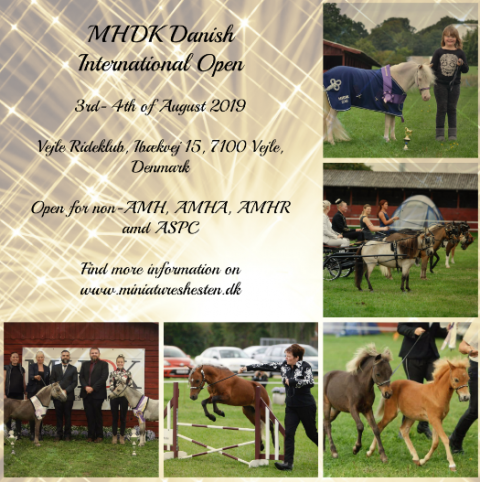 The show is open for all miniaturehorses up to 42'' and is inspired of the AMHA-rulebook. The the show is non-approved and is open to all horses - non-AMH, AMHA, AMHR and ASPC. Everybody can participate but it requires a membership in MHDK. Please join the show and help make this a tradition. We hope to see a lot of happy people ejoying the horses at the show! The show will be on the 3rd and 4th of August 2019! Do you want your name on a class at the show? You have the chance to buy classes and make sure your name is heared and spoken of at the show. MHDK will make sure to buy a nice trohpy, with your name on it, and name the class after the sponsor. You also have the possiblity to get you advertisement in the catalog and make sure everybody sees your stallion, stable or company.